Leave your card choice number and hair tie color choice here! Refer to the photos for card and color charts. See Example Below! 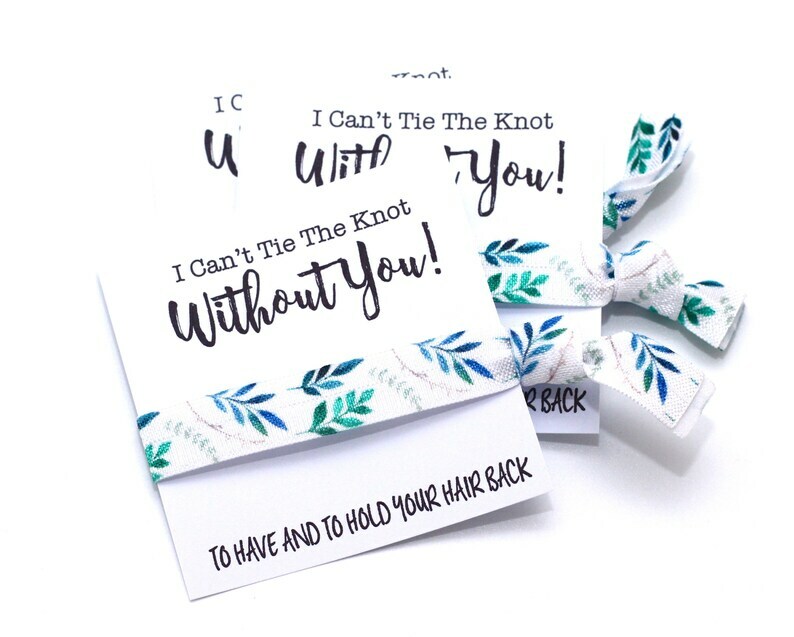 These hair tie cards are a fabulous addition to bridesmaid boxes, bachelorette bags or any other celebration! The greenery on these ties is GORGEOUS! 1 | Select number of favors needed from the first drop down menu CHOOSE QUANTITY HERE option. 2 | Select card + ink choice from the second drop down menu. Refer to photos when choosing. 3 | Personalization Section | Refer to the card selection photo to choose the saying for your cards. Write the corresponding number for the card you have chosen AND the color hair tie in the personalization section, there is an example shown above the personalization box. If choices are not left, you will receive the item/colors pictured by default. 4 | IMPORTANT, Leave the third drop down menu set to 1, you already chose your quantity in step one! 5 | Please be available until your order ships. I will send you and conversation through Etsy if I have any questions. If I am unable to get a hold of you, it delays the processing time. We are here to help you with any questions you may have after reading the ordering instructions! THANK YOU SO MUCH! We love creating the perfect hair tie sets for you! * We ship USPS First Class. We are not responsible for your purchase once it hits the post office. Didn’t get the right card at first but they made sure to get me what I ordered right away! Turned out perfect. Will make great gifts. Turned out to be the perfect color.